A quaich is a traditional Scots ceremonial drinking bowl. 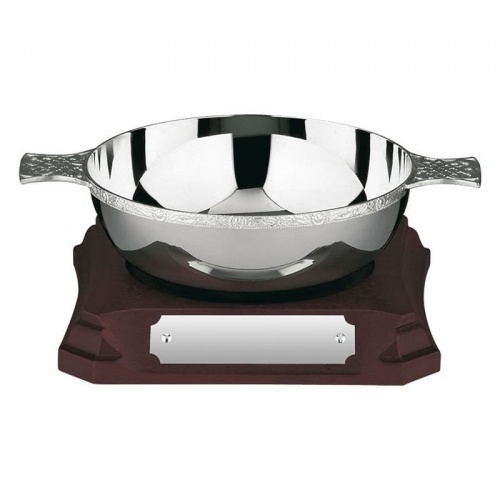 Featuring a celtic design rim and handles, these fine quality quaich bowls make outstanding awards items for a wide range of achievement and recognition awards, and general sports awards. They are polished bright inside. These celtic design bowls are perfect for engraving on the body and the plaque on the optional base. This silver plated quiach bowl has a diameter of 4.25in and is round-bottomed. An optional wooden base with engraving plaque is available.